I’ve got a bit of time this evening to write about the counter tiling job, but I’ll make this a two-part post, since this was a bigger job than any of the others I’ve attempted thus far! 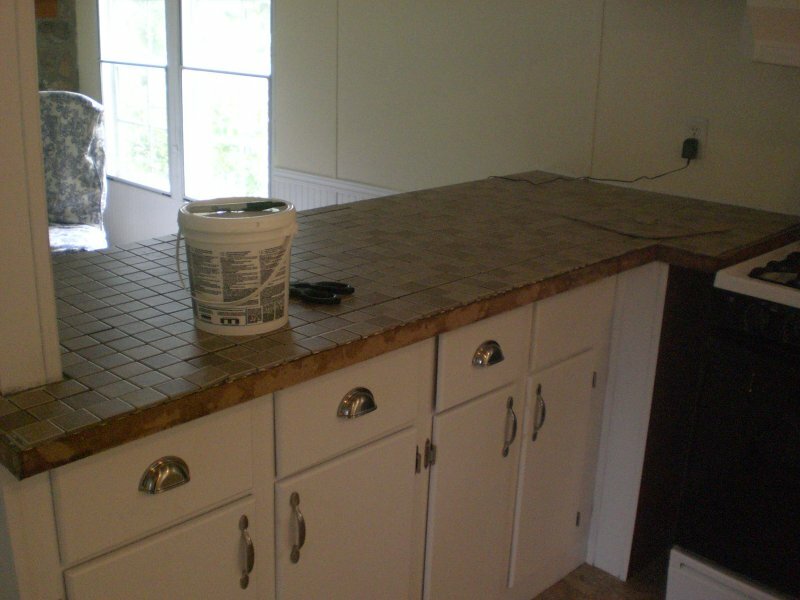 In this post I’ll cover preparing the laminate countertops and doing the actual tiling. Next time I’ll cover grout, clean-up, and sealing. I learned several things during this whole process, but the most important one fits the old Boy Scout motto: “Be Prepared!” This is true confessions time, and I hope all my goofs will help the next person avoid time-wasting mistakes. 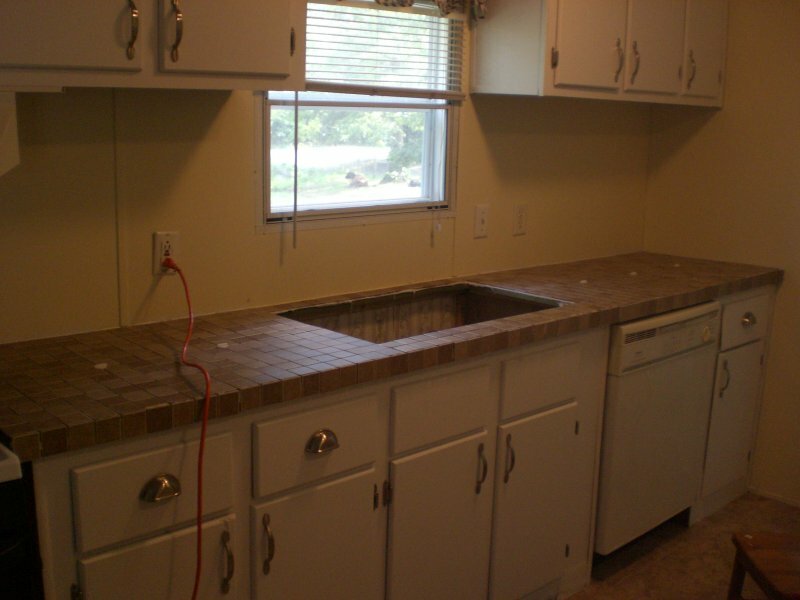 At left you see the original pea-green laminate countertop. The old sink has been removed so that I can tile right up to the edge of the hole. The new sink will fit down on top of the new tile. This sink, though brand new, was listed as “with blemishes” and so was only $29.99 instead of $80. 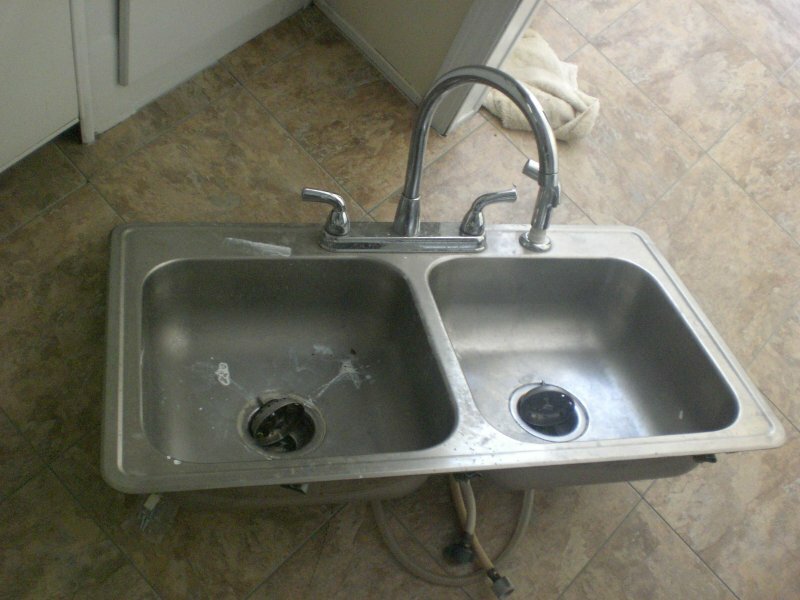 The seller explained that the sink had minor scratches or pitting–but nothing that would effect the overall quality of the sink. With $20 for shipping added on, I had a beautiful sink for just under $50! When the sink arrived, I opened the box and unwrapped it to check out the blemishes. For the life of me, I could not see them. 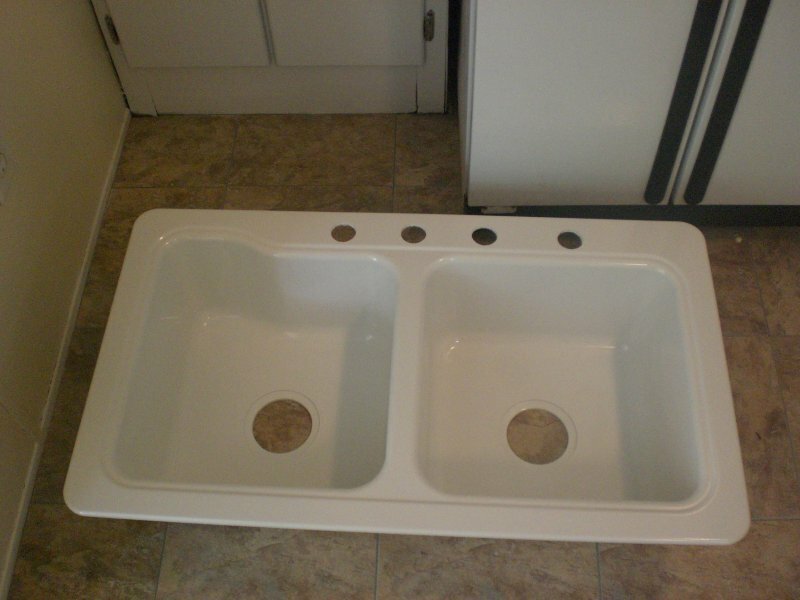 The sink is made of a special composite (tough like PVC), and it is white all through. I guess that must make the blemishes invisible, because I’ve never been able to find them! Before shipment, I requested the seller to drill a fourth hole in this standard three-hole sink so I could add a water purifier later. This has been one of my favorite finds during this trailer remodel. You’ll see later how beautiful the sink looks installed. But let’s move on to tiling! According to the helpful DIY instructions I found (and contrary to popular belief), you can tile directly over laminate counters. The old methods decreed that you’d have to put plywood over the laminate or use a special fiberglass paper (called “thin skin”) to cover the laminate completely prior to tiling. This just isn’t the case. 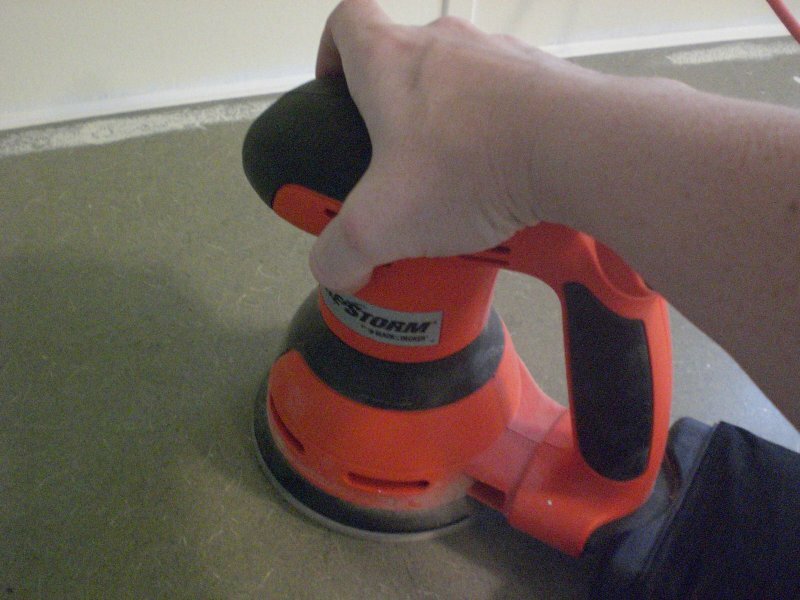 To prepare laminate to accept mastic (tile glue), you simply need to rough up the counter with #50 sandpaper on a hand-held rotary sander. And so we arrive at my first mistake. 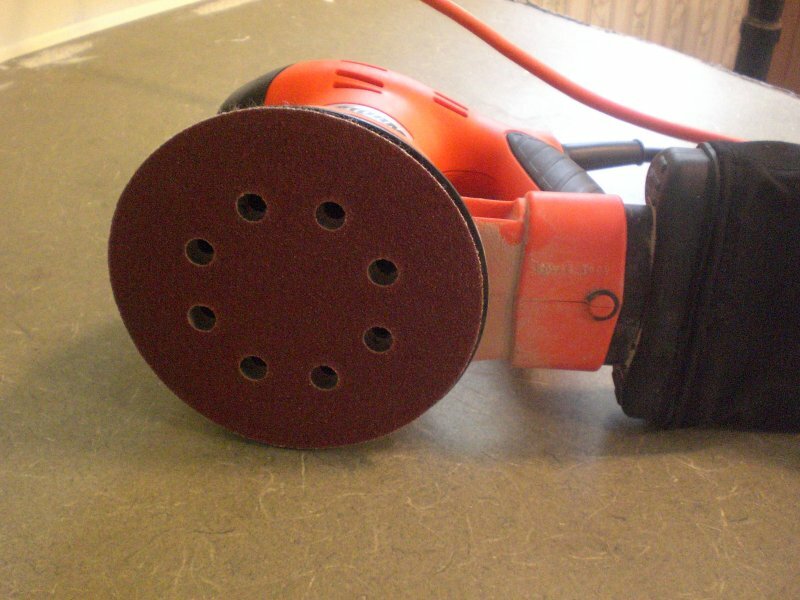 When I glanced at my sander’s accessories (including several circles of sandpaper), I thought I saw #50 sandpaper there. So I didn’t bother to stop at Lowe’s and pick up sandpaper before heading out to the trailer to put in a day’s work. On this trip, I’d hoped to get all the countertop prep done and start laying tile. I also planned to rent a tile cutter from the local Home Depot (12 miles from the trailer). After arriving at the trailer, I mentioned to our landlord that I’d be renting a tile cutter, and he told me that Home Depot in our area doesn’t do tool rental. However, he gave me the names of two other places that rented tools, so I drove 12 miles to check them out. Wouldn’t you know, both of them were closed that Saturday! I didn’t want to drive 20 miles to get to the next closest Lowe’s, so I just headed back to the trailer to rough up the counter tops, figuring I’d at least get that done and not make the day a total washout. When I began sanding the countertops, I noticed that they felt smoother rather than rough. So I pulled the sandpaper box out to check the number again. Whoops. #150! That was a far finer grain than I needed. I was actually just making the counter feel even silkier to the touch than ever! I dug through my stash of sandpaper rounds and had nothing lower than #100. Rats. That meant a trip back to town. I could have kicked myself for not double-checking the sandpaper earlier, since I could have gotten correct sandpaper at Home Depot on my first trip to find a tile cutter. Phooey. 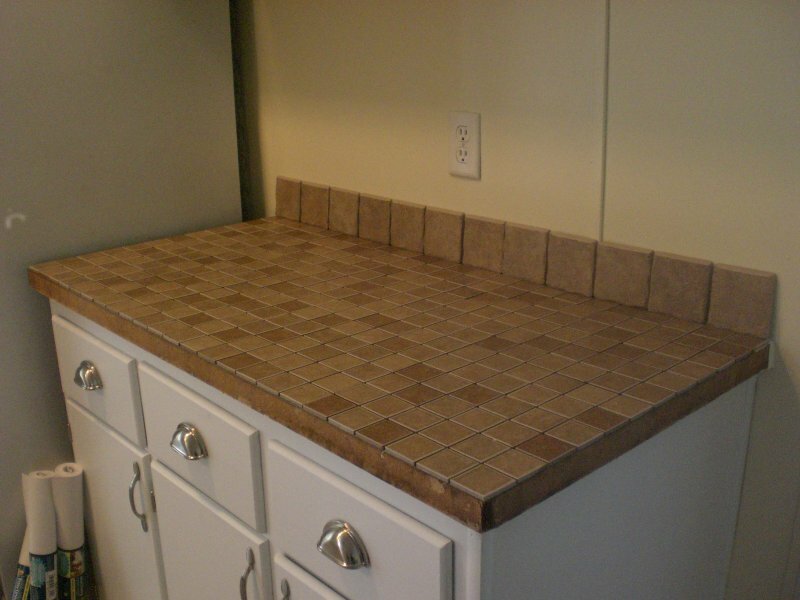 I even tested the backsplash tiles I’d gotten, and those were a perfect fit, too. The tile I purchased came from Lowe’s in one-foot square sections. 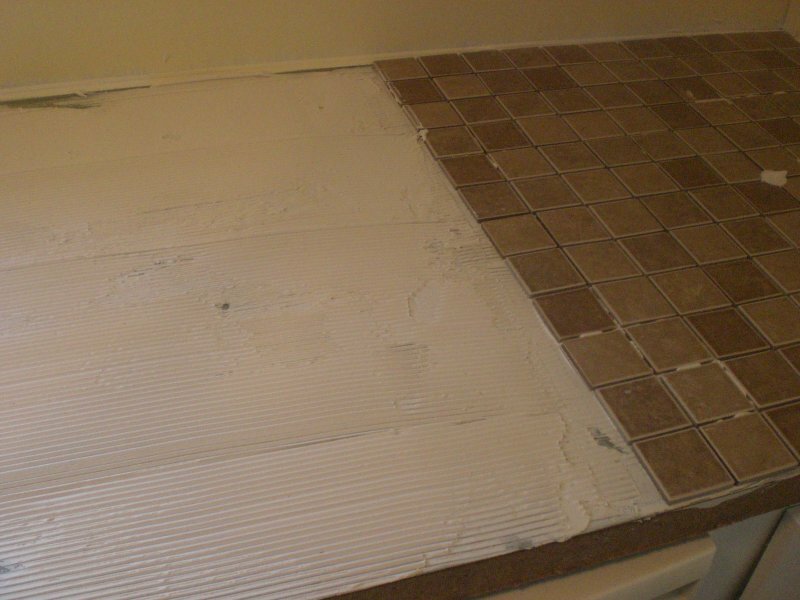 Each individual tile is slightly under two by two inches with 1/8″ spaces in between. The tiles are held together in a square by dots of glue. This is called “mosaic” tile and is typically used in showers, but it’s also fantastic for counters. I liked the shades of brown (doesn’t show dirt as easily) and the fact that I’d be able to set hot pots right on the counter. Can’t be beat! I’d already measured the counters to see what kind of square footage I was looking at, and from that I knew I’d need 50 12″x12″ sections (really 46, but I also planned to use individual tiles to cover the front and side edges of the counters). I’ll give you the cost breakdown in part two once I’ve added in mastic, grout, and the backsplash. 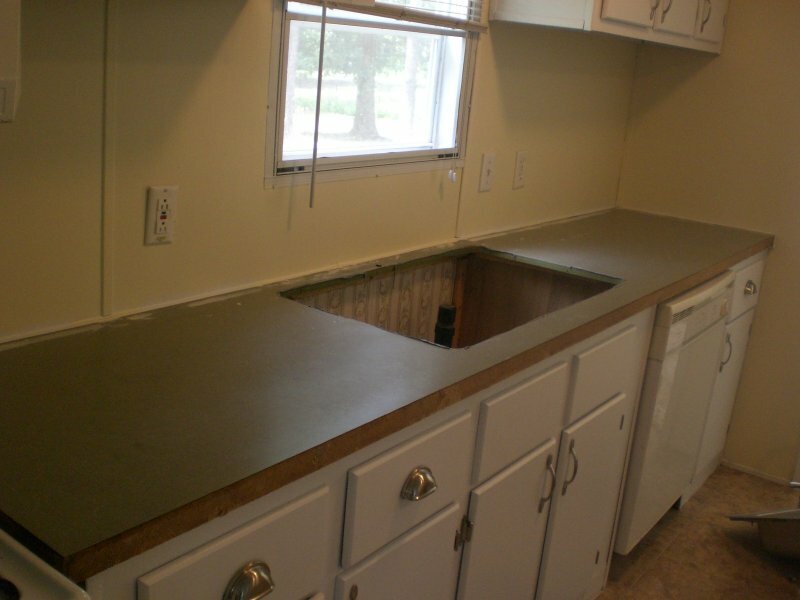 You’re going to be amazed at how inexpensively you can redo your countertops! Now that I knew one counter could be done with no cutting, I headed over to the most difficult counter–the sink section. I didn’t think it was possible to get around that sink hole without cutting at least some tiles. Imagine my great surprise when the tiles fit there exactly as well! Here you see the tile all laid out. Because the tiles were less than 2×2″ individually, it was easy to simply cut through the dots of glue to create smaller mosaic sections. As you can see, it only takes a row of tile one deep to go across the back of the sink. It’s a double row across the front. 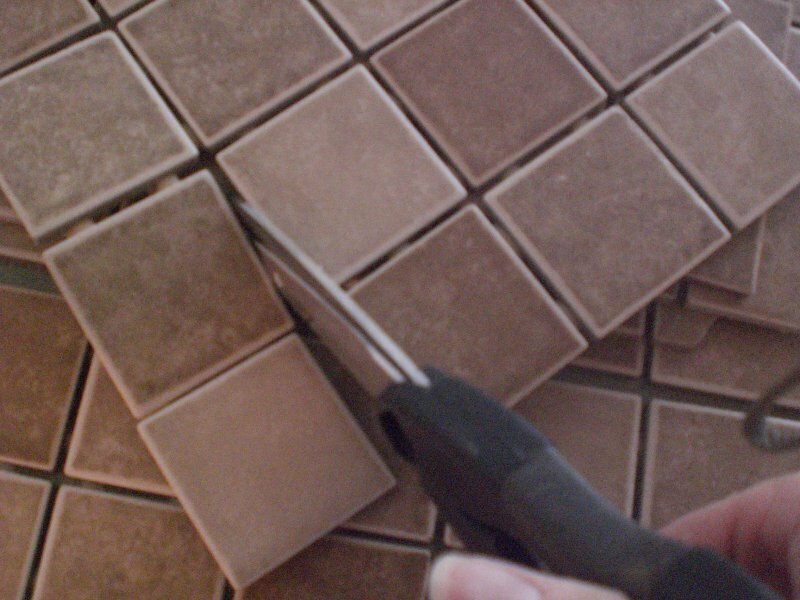 Below is a photograph showing how I cut through the glue to separate the tiles as needed. With a little snip, the scissors go right through the glue. 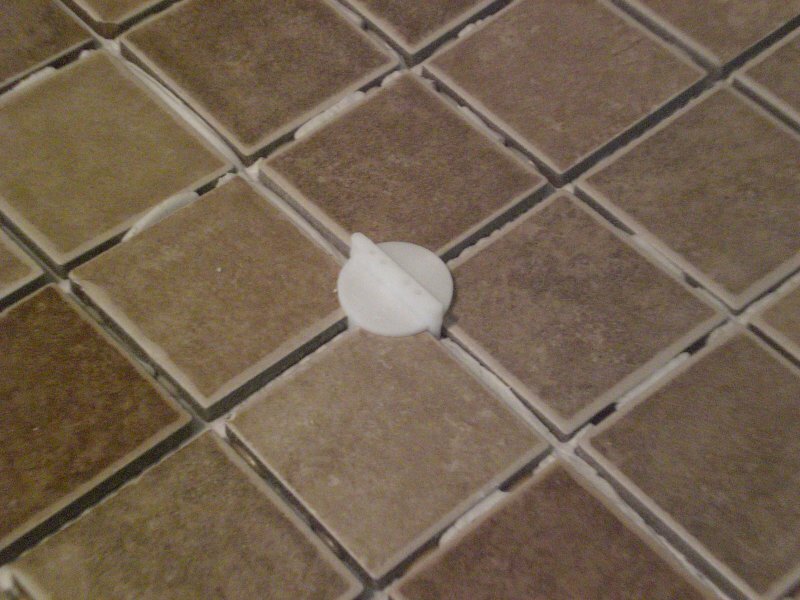 Any glue residue left on the edge of the tile can be peeled or scraped off afterwards to leave a smooth edge (particularly important for tiles that will line up with the edge of the counter–you don’t want glue showing there). No need to cut a single tile! So now I was thrilled that I hadn’t rented a tile cutter after all. I wasn’t going to need it. Quite providential. Now, when I’d pulled all the tiles out of the boxes, I found that Lowe’s had shorted me three 12×12″ mosaic sections (they come ten to a box, and one box had already been opened, unbeknownst to me). I knew all my tiles would fit on the countertops, but I still had those front edges to do, so I counted all the leftover pieces to make sure I had enough. Nope. I definitely needed those three extra sections. The day was drawing to a close, so I decided to head back home and come back the next Wednesday to do the extra tiling, stopping at Lowe’s first to get the three that had been missing from my box and to purchase the right sandpaper. When I stopped at Lowe’s four days later, they only had four pieces of my mosaic tile left, and two of them had broken sections. I spoke with the lady at the customer service desk, and she not only gave me the three I’d been missing, but she discounted the fourth I’d need to cover the broken tiles. Never hurts to ask for a discount when something is broken or damaged! I headed back to the trailer and jumped right in to sanding the countertops with the #50 paper. The difference was not as noticeable as I thought it would be, and the counters still felt relatively smooth to the touch. I worried that the mastic might not stick, but I went ahead and followed the DIY directions, wiping down the counters to remove any sanding residue before tiling. This is where the real fun begins! I purchased the spacers that have a little “handle” on the top to make them easier to remove when the tile is set. Conventional spacers can get stuck in the mastic, which means you have to pry them out later with a knife–no fun. The tile guy at Lowe’s recommended these spacers, and another video demonstration I watched online also showed how easy they were to use. I was very happy with the way they worked. At right you see the sink countertop completely tiled and ready for grout. 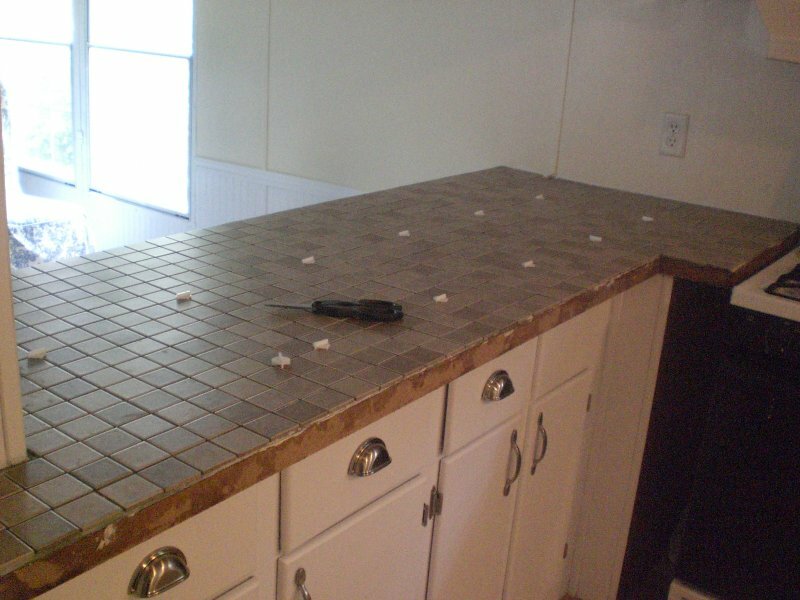 All told, it took about twenty minutes to tile this counter. I was amazed that it went so fast, and I moved on to the smaller counter next to the refrigerator, saving the more complicated peninsula for last. 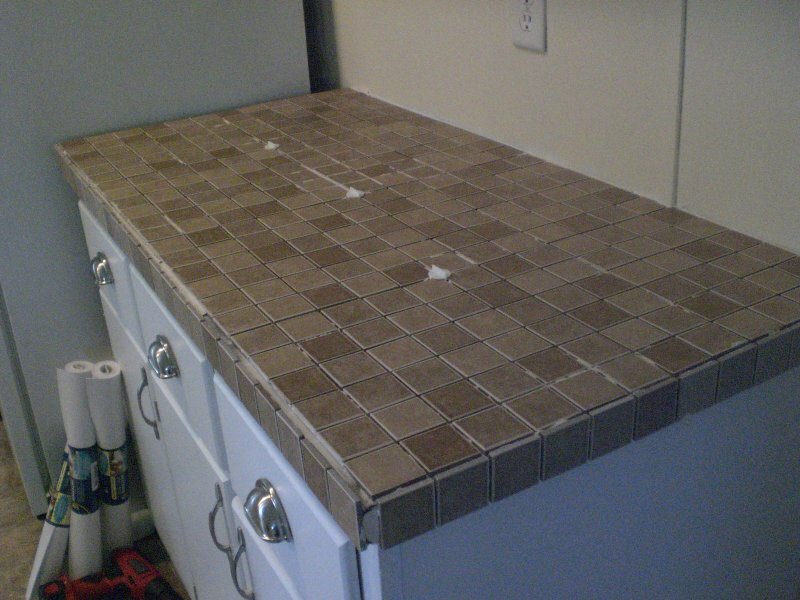 Mastic only takes about 45 minutes to set, so I intended to go ahead and grout the counters once I finished tiling. I figured I’d begin at the sink area, which would be set by the time I finished the other two counters. I’d purchased my grout at Home Depot, because Lowe’s didn’t have a color I liked. I wanted a brown grout that wouldn’t show stains, so I got a sandstone color from Home Depot in a 20-pound bag. The tile guy assured me this would be more than enough to grout the entire kitchen, including the backsplash (you can see in this photo that I hadn’t placed the backsplash yet). Finally, I tackled the last counter. This peninsula turned out to be a lot tricker than I’d anticipated, even though I’d already pre-fitted the tiles around the display shelf and on the odd little notch that sticks out next to the stove. 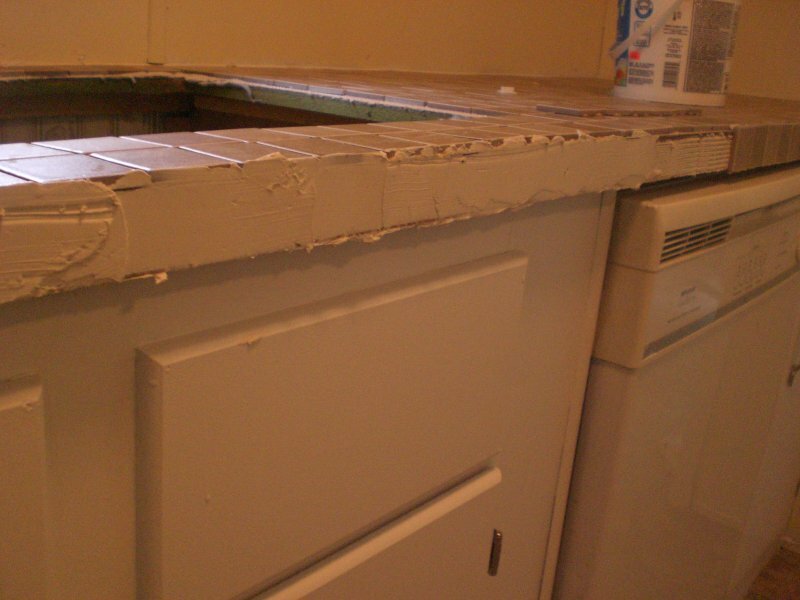 By the time I got to the end of the counter, I was also completely out of mastic, so that meant I wouldn’t be able to get the backsplash up that day or grout the countertops, either. I was disappointed, because I’d really hoped to wrap up the entire tiling job in two days. Word to the wise: a pro could get this done in two days, but amateurs need to add at least another day and a half for the learning curve and for silly mistakes (I was about to make another one–but that’s for part two!). 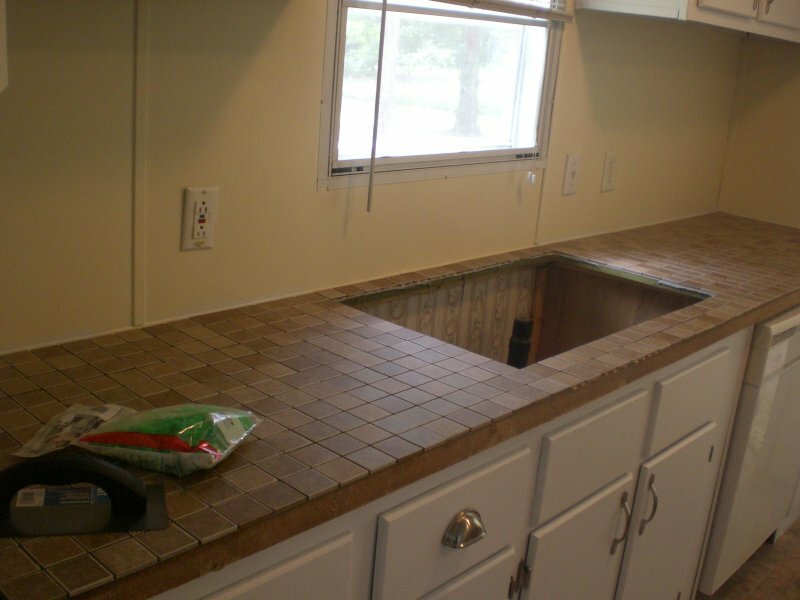 At the end of the day, I did have all three countertops nicely tiled and ready for grout. The following Saturday I’d be back to place the backsplash and tile the edges of the peninsula (there wasn’t enough mastic even for the small tiles). All in all, a good day’s work. I was just thrilled to see the difference between the old laminate countertops and the beautiful new tile. I cleaned up and headed home with the children, who had enjoyed a day playing at the new house while I tiled. In part two I’ll reveal a few more blunders and show you the beautiful end results of my amateur labors. If I can do this, so can you!